MINIMUM VOLUNTEER TIME: 2 Hours of any day, or weekend. LET US KNOW WHICH DAY(s) and time period you CAN COME! 1. Unskilled labor to dig trenches and bring wheel barrows of pebbles and sand to the trenches. Then to add a base of sand and pebbles, then lay and level semi-solid concrete blocks. 2. Unskilled labor to dig us weed-and-dirt clumps and rub them over a screen to save the dirt. There are 8 beds already built -- SEE PHOTO. Two more are needed to be built. 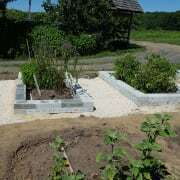 These beds form the borders of 10 beds full of medicinal herbs. Project is in Horsham, PA on a 17-acre organic educational farm of vegetables, flowers, and herbs. Goal: Each bed is 40" x 84", using 2 or 3 layers of cinder block walls (blocks are 4" by 8" by 16").